How To Optimize YouTube Videos To Rank – Keyword Research – Mass Media | Gain Exposure On Social Media! If you are interested in optimizing YouTube videos to rank higher in YouTube & Google’s search results this is information that you need to know! This is the second segment of our How To Optimize YouTube Videos To Rank series. If you haven’t had a chance to read part one, “How To Optimize YouTube Videos To Rank – Video Descriptions”, which focuses on optimizing video descriptions I suggest checking that out. 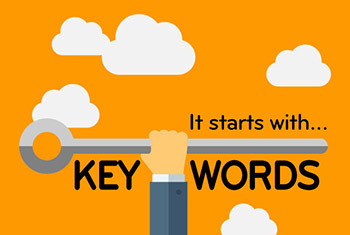 In this segment we are going to focus on keyword research. After all, there is an infinite number of keywords to choose from so it’s imperative to pick the most effective word or phrase that not only describes your video, but reaches the greatest number of people in your target audience. Let’s start off with some basics because choosing an effective keyword that’s more likely get your video seen is half the battle. If you remember back to the first optimization article, I mentioned that a video should only be optimized for a single keyword or phrase. With that in mind it’s very important that you choose a keyword that describes your video and is searched for frequently each month. We’ll refer to this as a top down approach. Alternatively, another strategy would be to select a less popular keyword that also produces fewer search results. This bottom up approach may sound counterintuitive, but it’s much easier to rank a YouTube video using less competitive keywords. Having a top ranking video that utilizes a bottom up approach could potentially get your video seen by many more people if your niche is very competitive. 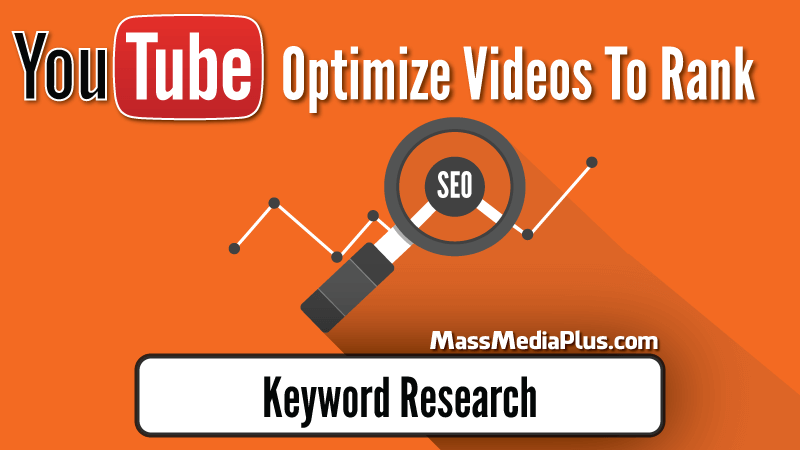 Deciding which keyword or phrase to optimize a video for is not a difficult process. There’s no secret technique or magic formula and in most cases knowing which words to target is common sense. But that does not mean you should just blindly pick a word relevant to your video without doing a little research, especially if you are trying to get your video ranked in a top position on YouTube. If you’re not willing to spend at least 5-10 minutes on basic keyword research then you might as well hope for the best and not even bother with keyword optimization. Seriously, it would be no different than pointing to a random spot on a map of where you live to determine where you should open a store. Sure you may still get customers, but the business would have been significantly more successful had the location been chosen based on where competitors are located and daily traffic patterns. Keyword research is no different and I can’t stress enough the importance of knowing the average search volume and competitiveness of keywords. The first step is to create a short list of niche specific keywords or terms to rank for that also describes the video. I suggest starting the list with very broad terms that get progressively more specific about the video’s content. Ideally you would want to target broad keywords which tend to have higher search volumes, but the competition for these broad terms will be higher as well. If you are having trouble creating a list of keywords or think you may have missed a good opportunity there are a few tools that can help you out. Google & YouTube’s Search autocomplete function does generate a list of popular queries based on what you have typed into the search bar. Personally I’m not a fan of using autocomplete for selecting keywords since the algorithm factors in your personal search history. This causes the results displayed to vary from person to person and does not necessarily display an accurate list of popular or trending terms. Here’s a link to Google’s dev notes for anyone interested in learning a bit more about autocomplete. Another free tool available to generate a list of keywords for YouTube videos is called Keyword Tool (quite an original name). This tool can be used to find search terms in Google, YouTube, Bing, Amazon, and the App Store. Keep in mind that the free results are not displayed or organized in any particular order. The free tool sends a query to Google and lists the results in the order received. Keyword Tool does offer a subscription based service that provides more information about search volumes and keyword competition, but it’s pretty pricey unless you do a ton of SEO work. 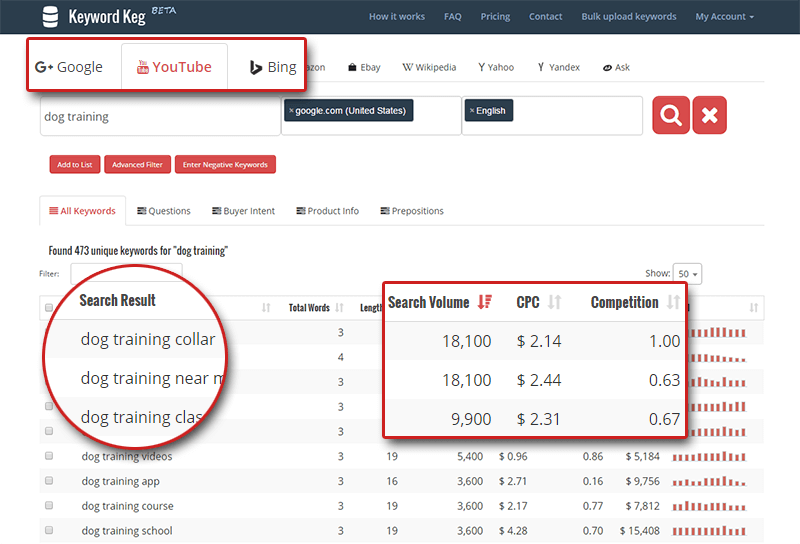 Regardless Keyword Tool is a great way to create and export a list of potential keywords for your videos. Now it’s time to filter your list and narrow down the selection. We’ll start by getting more information about the average monthly search volume and competition of each term. 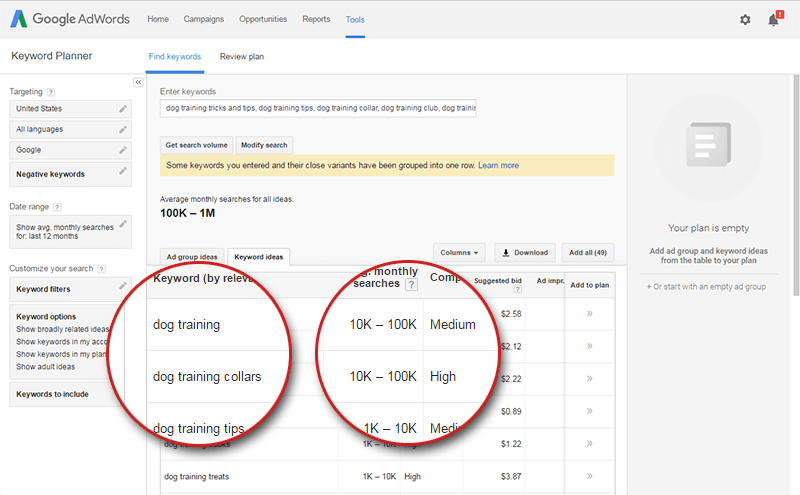 A quick way to do this is by using the Keyword Planner through Google Adwords. You can literally copy and paste your entire list of keywords into Adwords and it will kick out the results, but Adwords has its drawbacks. There is a strong correlation between Google & YouTube Search, but since the information provided by the Keyword Planner is based off Google it’s not going to be entirely accurate for our purposes. Another problem with Adwords when using a free or low budget account is that only partial information is provided. The platform only displays search volumes as a range (100 – 1k, 1k – 10k, 10k – 100k etc.) instead of showing the exact search volume. 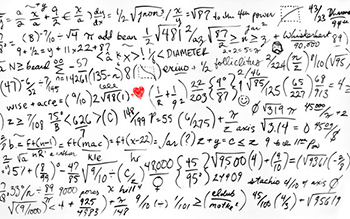 But if you are just trying to get a ballpark estimate the Keyword Planner will get the job done. You can also export the results as a spreadsheet to see more information such as the level of keyword competition listed as numeric values. Each keyword is given a competiveness score based on a 0 to 1 metric. We recently came across a new tool and service called Keyword Keg that’s extremely helpful and easy to use for getting keyword suggestions, search volumes, and competition values specifically for YouTube. The results are displayed by country and more refined search filters are also available. Keyword Keg provides similar information for other search engines and platforms as well. This service is currently in beta, but it’s very accurate and for the time being displays the complete details of the top 10 results for free. Complete access to Keyword Keg is only $8/month, which is a steal compared to the cost of similar services. 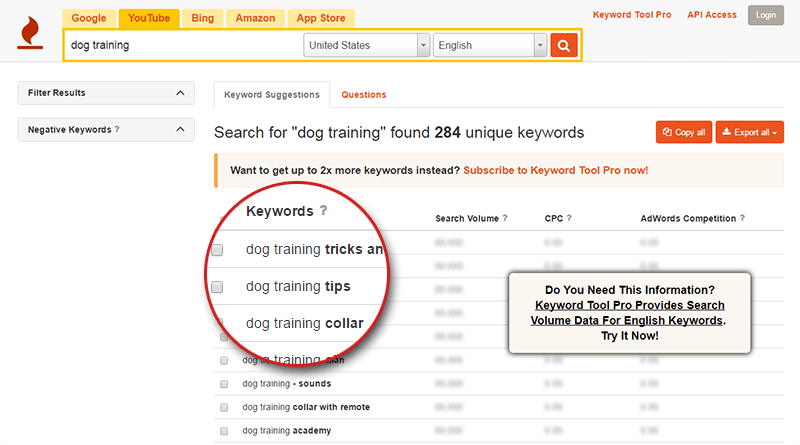 Once you have the search volumes and competition values for your list of keywords it’s finally decision making time. The word or phrase you choose to optimize for should be based entirely on your ambition and tolerance for competition. Keywords with high search and competition values will obviously be more difficult and take longer to rank, but it is possible depending on your level of commitment. Remember to consider either a Top Down or Bottom Up approach. If you find yourself struggling to choose between a few keywords you may also want to compare the total search results of each term on YouTube. That pretty much wraps up keyword research for optimizing YouTube videos to rank. Hopefully this information was helpful. At the very least, you should now be able to make well informed decisions to select effective keywords. Should anyone need additional assistance ranking videos or gaining exposure on YouTube and other networks, we do offer a number of services here on Mass Media+ that can help. Expect more articles like this and another YouTube optimization segment on video titles in the near future! We're here to help you gain influence and exposure on social media! Regardless of whether you are trying to grow an audience on a small personal profile or large corporate account, we strive to provide our clients with the information & resources needed to achieve their goals. Get awesome tips to improve the effectiveness of your social media campaigns delivered right to your inbox!